RecSolution is a modular software solution for the input, processing and classification of paper-based and electronic documents, and for the extraction and validation of documents contents (Data Capturing). In addition, RecSolution offers a Workflow module for the illustration of document-based work flow processes. 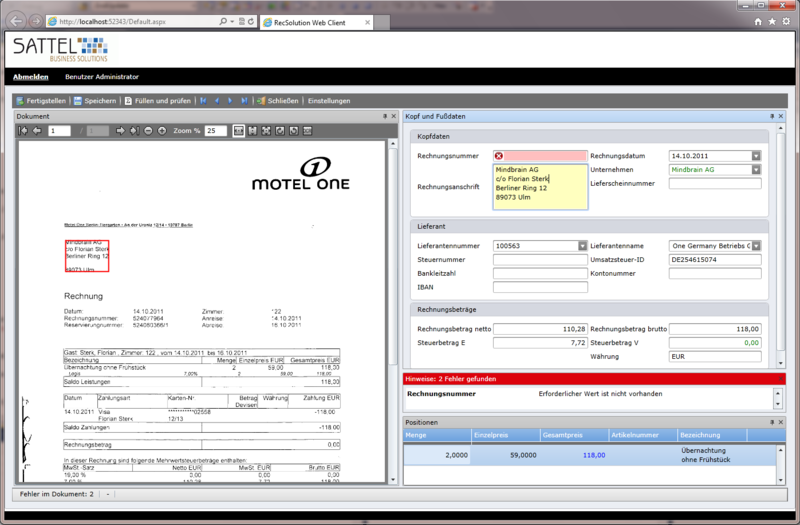 The areas of application of RecSolution range from the automatic processing of invoices, orders, delivery notes, remittance advice notes and order confirmations to the classification of insurance, vehicle and personnel files and the recognition of handwritten forms and the processing of electronic data records such as EDIFACT or ZUGFeRD. RecSolution has a modular structure and can thus be licensed and configured for the relevant intended application. Automatic data extraction and indexing of header/footer data and detail/item data via self-learning free-form recognition or template recognition.